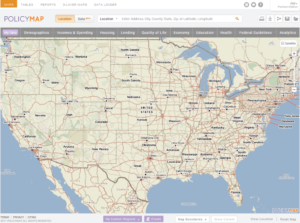 PolicyMap is a web-based, online mapping and reporting tool that offers data on U.S. demographics, real estate, health, jobs, education, and more. The program allows users to make maps, tables, and reports from an extensive collection of datasets. While some features of PolicyMap are available for free, the Library’s paid subscription and site license mean you have access to more data, including proprietary data, as well as powerful mapping, reporting, and analytical tools. The PolicyMap Data Directory details their complete list of public and proprietary data sources. PolicyMap offers several tutorials and guides to help users learn and finesse the tools and features. For even more detail, the PolicyMap Primer provides a complete overview of all the PolicyMap features and functions. If you have questions about PolicyMap, please ask a librarian.